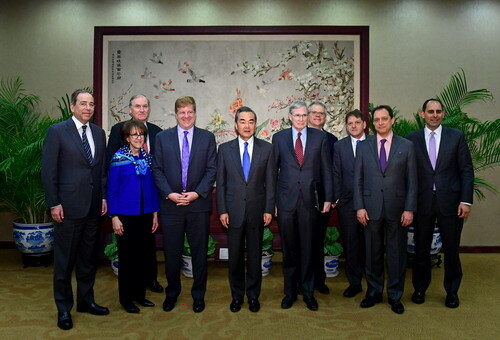 On February 19, 2019, State Councilor and Foreign Minister Wang Yi met in Beijing with the delegation of former political heavyweights of the United States (US) led by Executive Vice President of the US Chamber of Commerce Myron Brilliant. Wang Yi pointed out that China-US relations are one of the most important bilateral relations in today's world. Mutual respect and mutually beneficial cooperation are not only the right choices for both of us, but also the general expectations of the international community. China's reform and opening up is first of all in line with China's own development needs, and also conforms to the trend and direction of the progress of the times. China's door of opening up will surely open even wider. As long as China and the US meet each other halfway in an active manner, economic and trade cooperation can still serve as a ballast stone of China-US relations. Wang Yi stressed that like the US, China also has the right to develop and the Chinese people also have the right to live a better life. The US side should recognize that China's development serves the interests of both the world and the US. Only regarding China's development as an opportunity for the US can help fundamentally resolve some issues between China and the US, including economic and trade issues. It is hoped that the US side can accept with an open mind that China with a population of nearly 1.4 billion will move toward development and prosperity. Wang Yi pointed out that the Chinese civilization has never cherished expansion. China embarks on a path of development that is totally different from the stereotype followed by traditional major countries that once a country grows stronger, it will seek hegemony. China adheres to its own peaceful development and pursues the opening up strategy for mutual benefit and win-win results at the same time. In the era of globalization, all parties should abandon the Cold-War and zero-sum mentality. The US side noted that China is a great country and the Chinese people are great people. The US welcomes a prosperous China, which is a good deed for both the US and the world. US-China relations are in multiple dimensions. Both sides should make more efforts to enhance mutual trust and maintain dialogues and cooperation on a wide range of international and regional issues. Economic and trade relations have served as a ballast stone of the relations between the two countries for a long time. The US pays high attention to the ongoing high-level economic and trade consultation between the US and China, and hopes that both sides can reach a comprehensive and ambitious agreement, and exert lasting and positive influences on bilateral relations. Those with insight from the Democratic Party and the Republican Party of the US are willing to continue their efforts to promote US-China dialogue and the development of the relations between the two countries. On the occasion of the 40th anniversary of the establishment of diplomatic relations between the US and China, the US side looks forward to having the opportunity to push US-China relations to new highs. 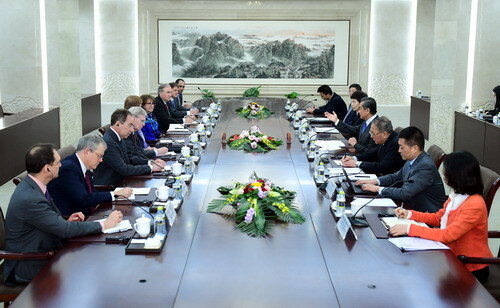 Members of the delegation of the US side include former Assistant to the President for National Security Affairs Stephen John Hadley, former Trade Representative Charlene Barshefsky, former Deputy Secretary of State Thomas Nides, former Deputy Secretary of the Treasury Robert Kimmitt, and former Deputy Secretary of Commerce Bruce Andrews of the US.